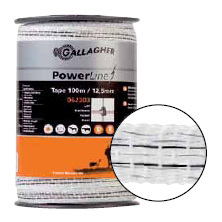 Strong, 12.5mm PowerLine Tape with 4 thick stainless steel wires and 1 mixed metal wire for good conductivity. Suitable for portable fences for cattle, young stock and horses. Post spacing up to 5m. 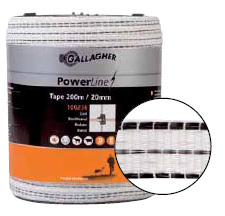 Clearly visible PowerLine Tape with black reinforced edges . Ideal for semiportable horse fencing. 5 thick stainless steel wires and 1 mixed metal wire for good conductivity. Post spacing up to 5m. 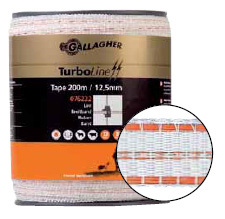 12,5mm TurboLine Tape. The horizontal wires are interconnected at 13 cm intervals ensuring better conductivity. 40 times more conductive than standard polytape. Ideal for portable electric fences. Post spacing up to 5m. 200m and 400m rolls. Always use TurboLine tape if fence > 500m.